Julie Berg is an Associate Professor in the Public Law Department and the Director of the Institute for Safety Governance and Criminology (previously the Centre of Criminology) at the University of Cape Town. Julie holds a BSocSci(Hons) MSocSc (with distinction) and PhD from the University of Cape Town. 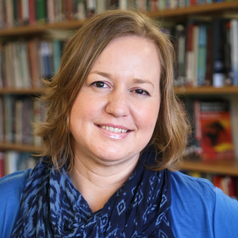 Julie’s research focuses primarily on innovations in security governance (in Africa), collaborative policing and policing networks, as well as issues of legitimacy, accountability and democratic security for the public good. She has also been actively involved in developing design principles for effective and accountable security governance, based on her research. In this regard, Julie has made a number of policy contributions towards developing frameworks and guides for better safety and security in South Africa. Her recent contributions to policy include co-developing a paper and presentation to the South African National Planning Commission (NPC) on Achieving Sustained Citizen Safety in South Africa. The submission of the paper informed the National Planning Commission’s key vision document The National Development Plan 2030 released in November 2011. Julie was also an expert witness for The Commission of Inquiry into Allegations of Police Inefficiency in Khayelitsha and a Breakdown in Relations between the Community and the Police in Khayelitsha and was involved in implementing, in Khayelitsha (and in co-operation with the government, state police and local civil society) some of the key recommendations made in the report to improve safety in Khayelitsha. Related to this, Julie was involved in collaborating with the Provincial Government of the Western Cape in South Africa to develop a ‘whole-of-society’ approach to safety, which entails reshaping and improving safety and security in communities. Julie is a steering committee member of the Safety and Violence Initiative (SaVI) at UCT, which is a network of scholars geared towards research and policy engagement on issues of violence in Africa. She is a council member of the Criminological and Victimological Society of Southern Africa (CRIMSA) and an editorial board member of the journal Acta Criminologica.